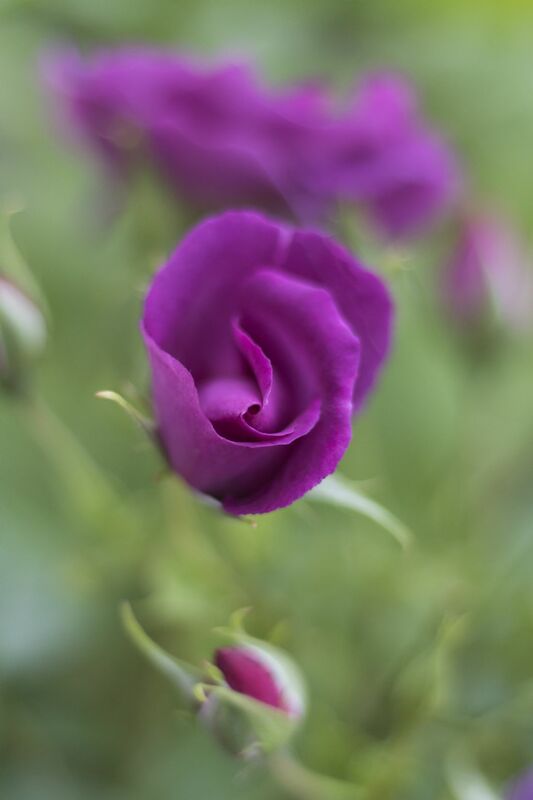 These romantic mauve roses have a wonderful colour and perfume and are a delight to see and smell. 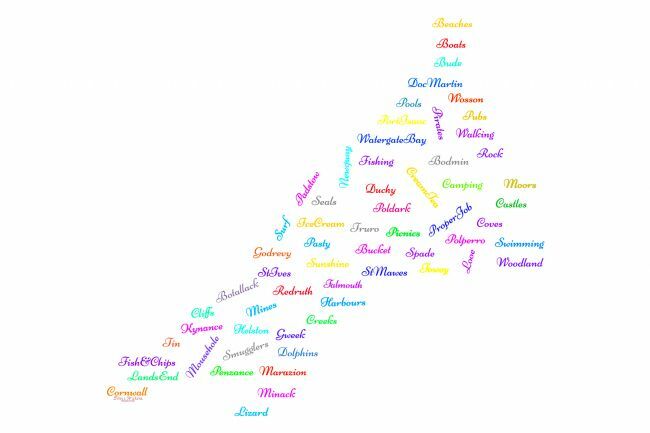 DescriptionA map of Cornwall created with place names and things to do. 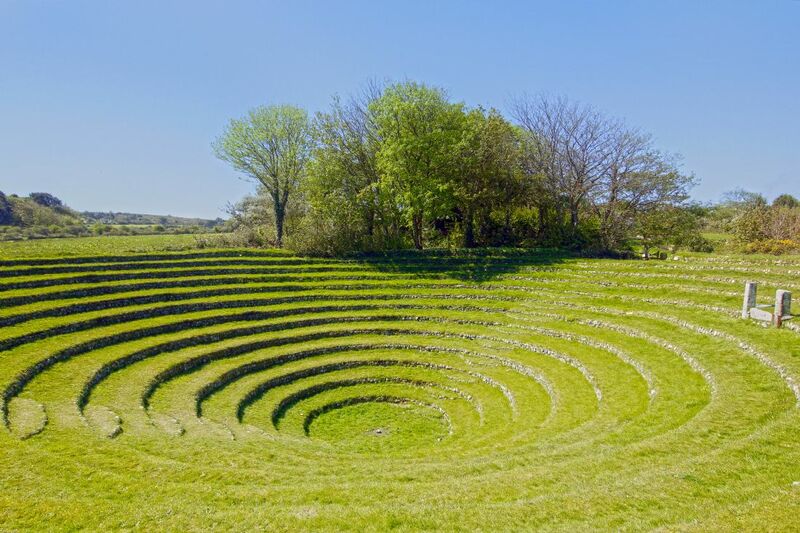 A tiered amphitheatre-like structure on the outskirts of Redruth Mid Cornwall, Gwennap Pit now stands as a memorial to the Methodist movement across the UK in the 18th century, and is also in full use as a place of worship. It is thought this geographical and historical anomaly was formed by the falling of old mine workings and marks the spot preacher John Wesley termed “the most magnificent spectacle this side of heaven”. 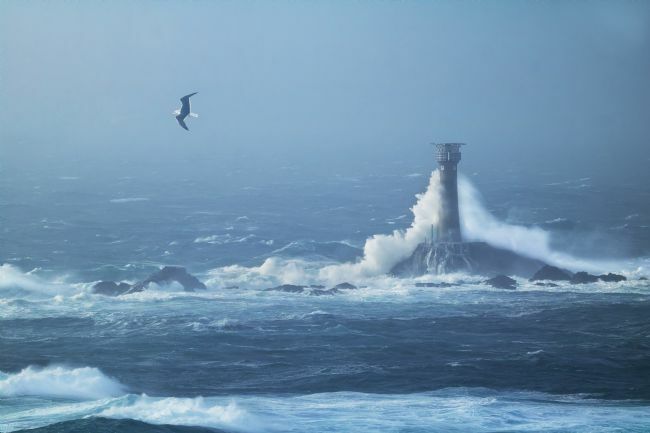 Gwennap can hold a crowd as large as 1,500 around its 12 ‘rings’. I'm not usually up before the sun but one morning in October 2018 I was wide awake so decided to cycle up the hill to the field above Mylor Bridge and Restronguet to watch the sun come up over The Roseland Peninsular. I'm so glad I did as this golden sunrise will never be forgotten. Not the busy port it was when mining was in its heyday in Cornwall, Portreath on the north coast is still a magnet for surfers and photographers, especially when a storm is forecast and I couldn’t resist stopping by with my camera at high tide in March 2019. As usual the new Monkey Hut, as it is known by the locals, was getting a battering. 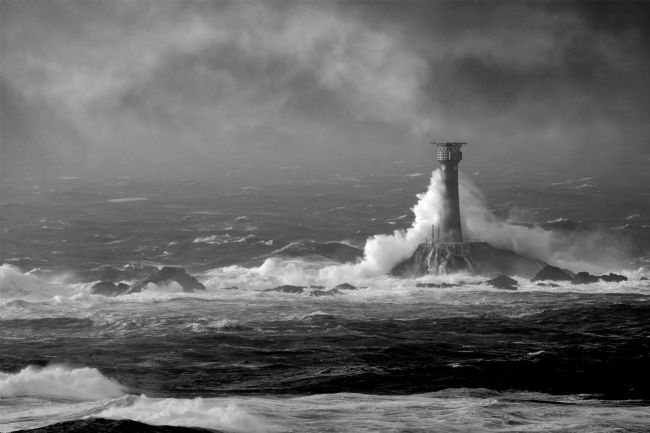 The old one was washed away in the storms of 2012 and this replica was built to replace it. 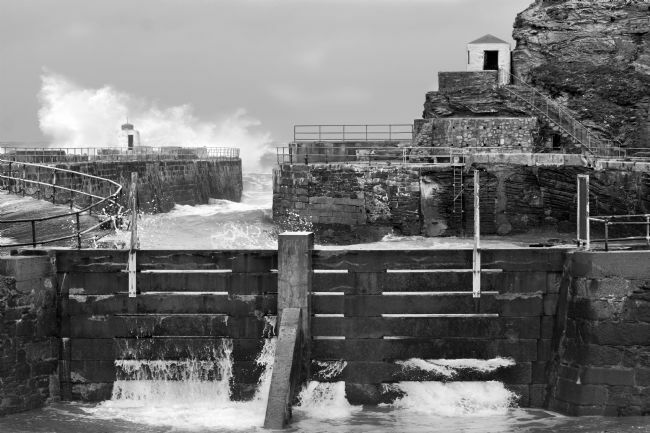 The shelter dates back to 1824 during the days when Portreath was a busy port, shipping coal in and copper out. The harbour was important but the entrance was very treacherous. The Monkey House was used for shelter by the harbour pilots who would wave flags or lanterns to guide ships into harbour, or warn away if conditions were too dangerous. Designed in the mid-19th century to bridge the gap in ship guidance in the Bristol Channel between the Longships lighthouse near Land’s End and Lundy off the coast of North Devon, Trevose Head lighthouse sits proudly on the headland warning passing ships of the dangerous coast. Trevose’s keepers’ cottages have now been converted into holiday lets, offering visitors a unique place to stay, with stunning views and a real understanding of being exposed to the elements, though ear plugs are recommended in times of fog! The Red Arrows display team entertaining the crowds at Falmouth Week 2016. The Royal Air Force Aerobatic Team, the Red Arrows, is one of the world's premier aerobatic display teams. 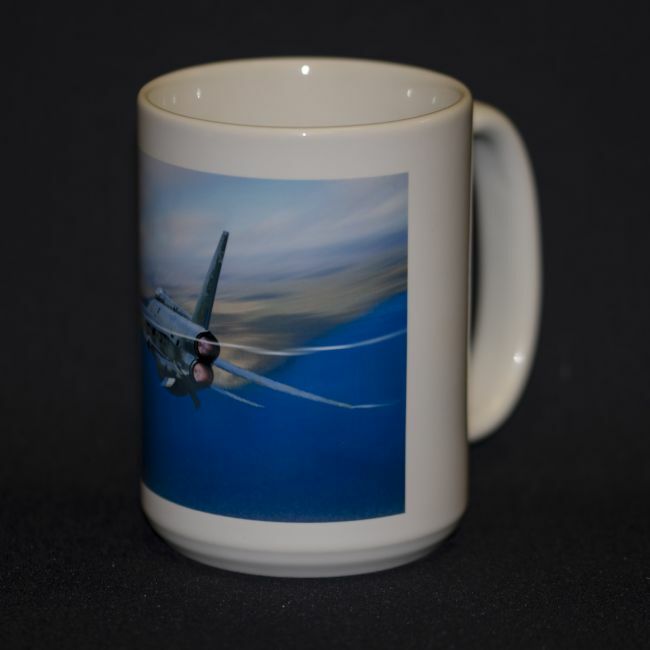 Representing the speed, agility and precision of the RAF, the team is the public face of the service. 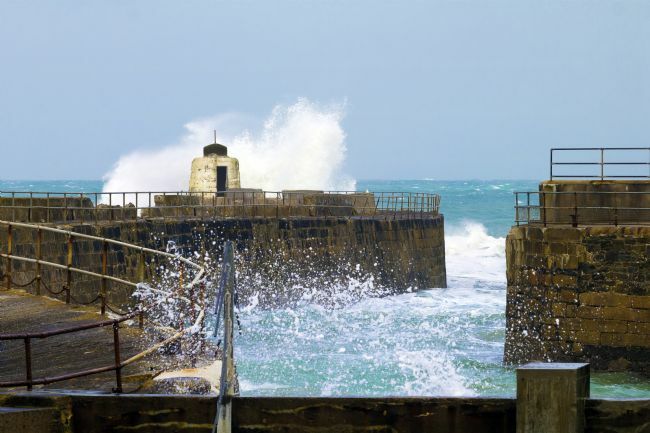 Not the busy port it was when mining was in its heyday in Cornwall, Portreath on the north coast is still a magnet for surfers and photographers, especially when a storm is forecast. 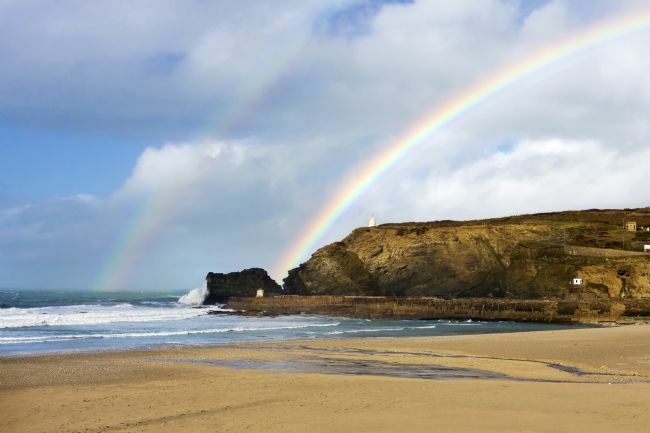 On this particular day in March 2019 I went down to the beach as the tide was coming in with a near gale force wind behind it and was overjoyed to be greeted by a double rainbow over the Monkey House and Pepper Pot on Lighthouse Hill. 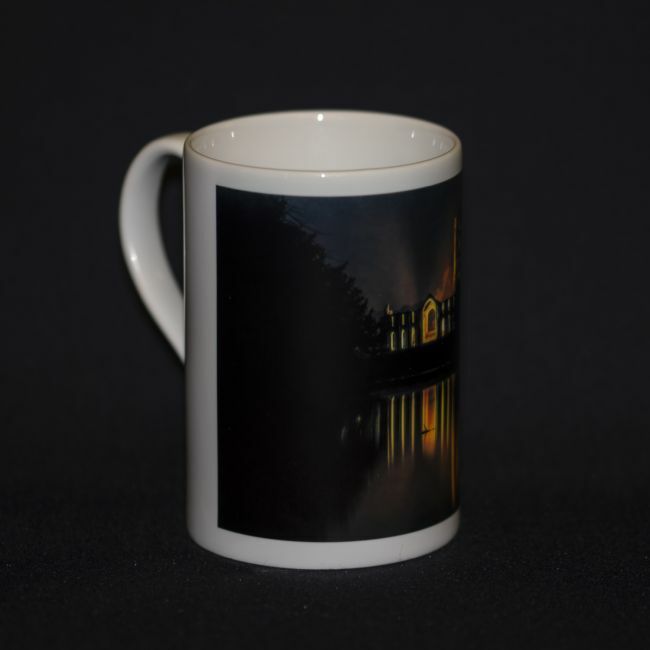 It was nearly high tide in Portreath on the north coast of Cornwall and the light was beautiful as the sun started to go down behind Battery Hill, illuminating the Monkey House and Pepper Pot in a soft golden glow. 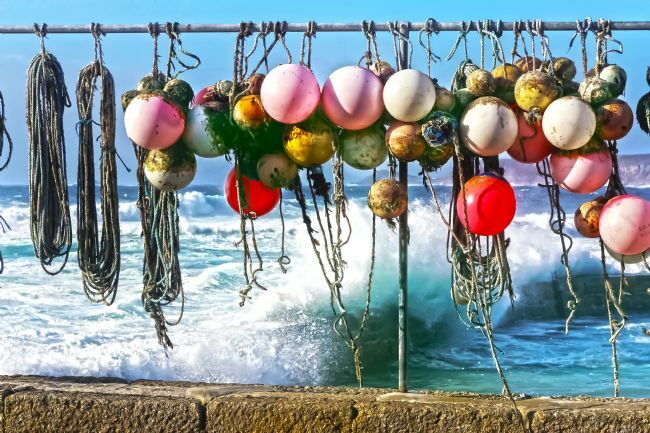 A bright and colourful image of fishing buoys and ropes out to dry at the end of the fishing season in Sennen Cove harbour, Cornwall, England. 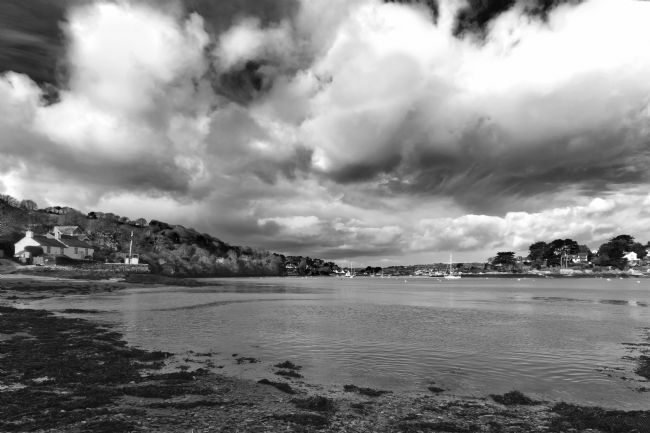 The view from the Pandora Inn down Restronguet Creek and the River Fal towards Carrick Roads and the Roseland on a beautiful day in October. The Truro River in Cornwall is one of six main tributaries that eventually flow with the Fal into the Carrick Roads, along with twenty-eight minor creeks and rivers, many of them, such as the Penryn River and Restronguet Creek, navigable by boat. Bluebells carpeting the ground under the trees in Enys Gardens, Penryn, Cornwall. St Mawes is a beautiful castle on the Roseland in south west Cornwall any time of day, even more so at sunset. 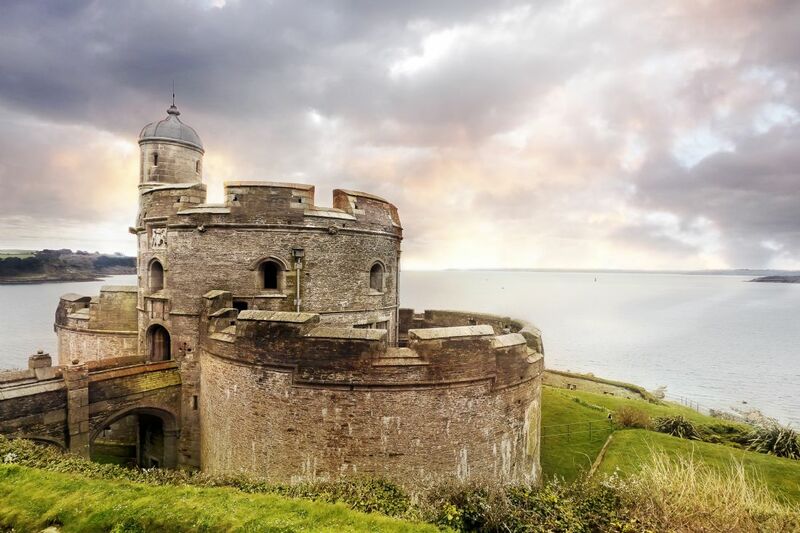 It sits majestically on the hill opposite it's larger partner, Pendennis Castle guarding the entrance of Falmouth Harbour and Falmouth Bay. 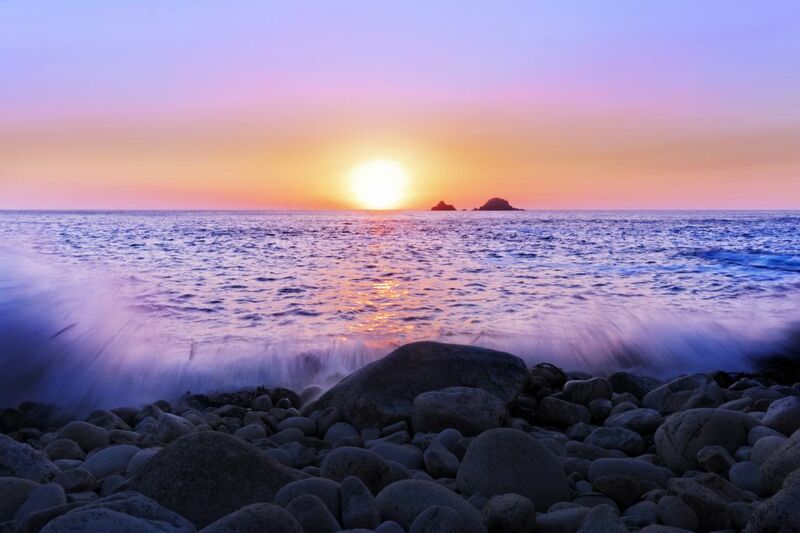 The sun setting over The Brisons seen from Porth Nanven Cove as the tide come in. 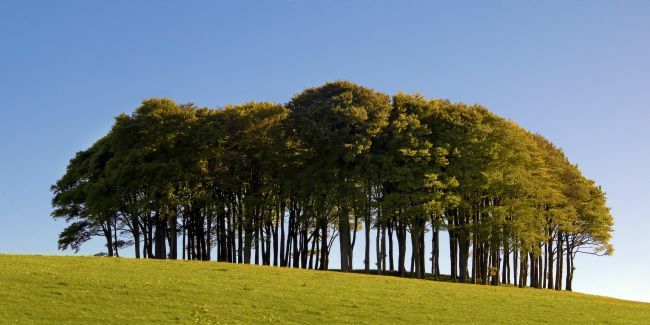 Cot valley is a beautiful valley dissected by a narrow stream running northwest to the coast between Land’s End and Cape Cornwall. At the bottom of the sub-tropical valley you will find Cot Valley Beach, also known as Porth Nanven Cove. 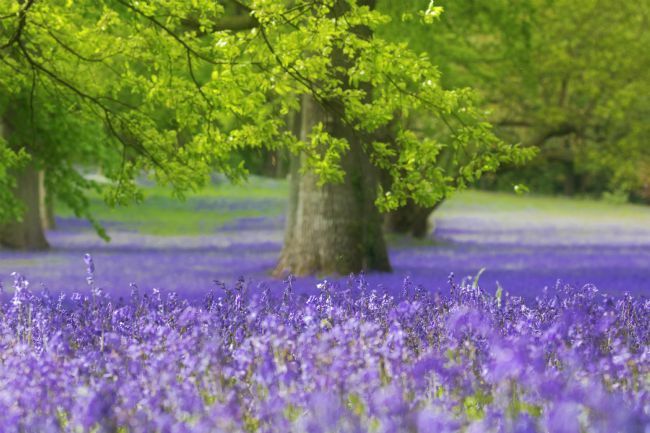 A springtime carpet of English bluebells in Cornwall. 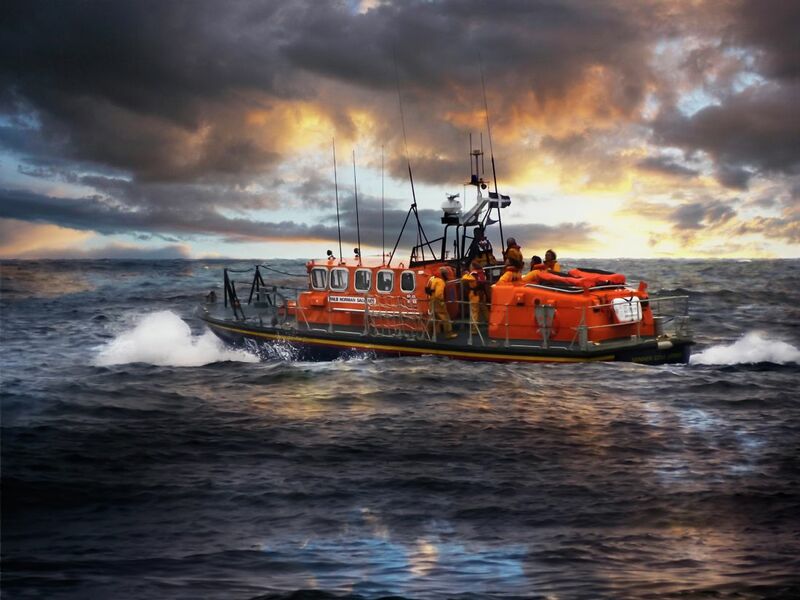 The Sennen Cove Lifeboat and brave crew heading out on a shout in Cornwall. The Gyllyngvase beach side of Pendennis Castle is the perfect place to watch the moon rise over the sea. 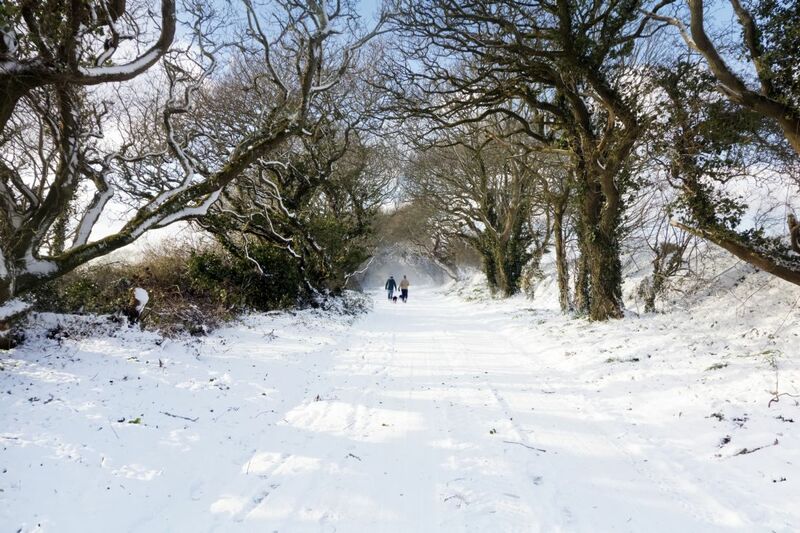 A couple walk their dogs in the snow on their way towards Restronguet Hill at Mylor Bridge in Cornwall. 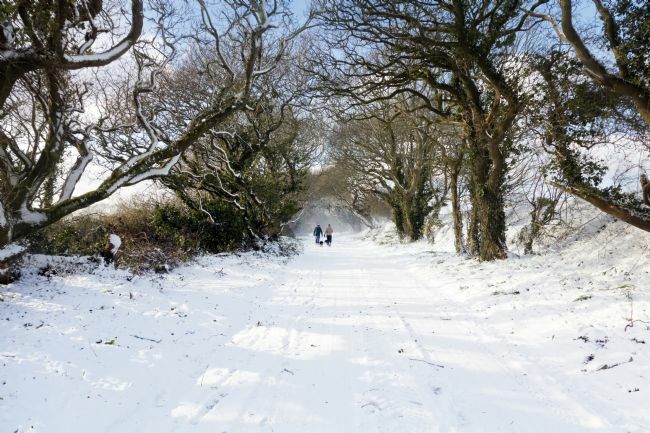 Snow is unlikely in Cornwall but at the end of February 2018 we got a few days of snowfall that settled making a whole new fresh white landscape. 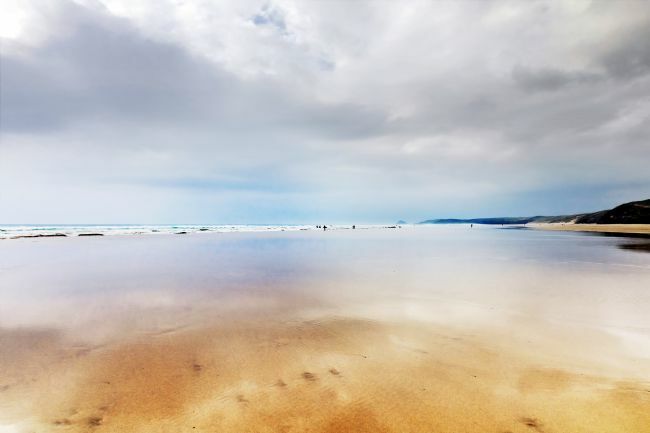 Low tide at Perranporth on the north Cornwall coast. 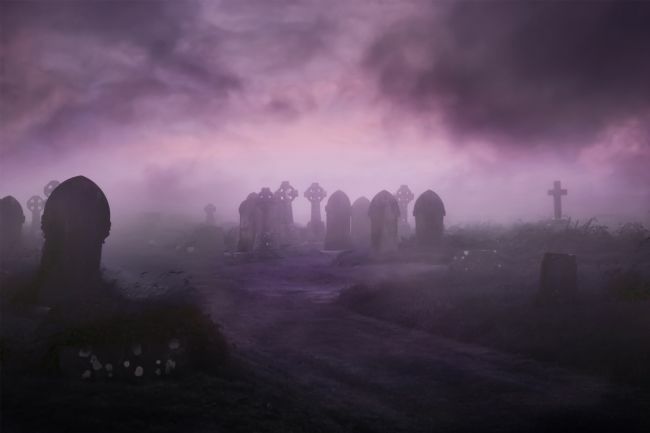 The tomb stones look like they are partying into the night in this purple and pink toned graveyard image.